Poor people should have a chance at justice. That idea is dear to the hearts of many legal aid supporters across the state, and a case under deliberation by the Texas Supreme Court could have far-reaching implications for low-income Texans seeking a lawyer – and the legal aid organizations trying to help them. Since 2010, the Tarrant County district clerk’s office has collected more than $60,000 from hundreds of Texans who filed documents stating they were too poor to pay court costs. Those documents, called affidavits of indigency, are designed to ensure that poor Texans have a chance to get their case heard in court. But in Tarrant County, District Clerk Tom Wilder came back to those Texans, often long after their case was closed, to demand payment for court costs, even threatening to seize property if the money was not paid. A team of pro bono lawyers that now includes former Texas Supreme Court Chief Justice Wallace Jefferson is fighting to end that practice, which they regard as potentially devastating to millions of low-income Texans. Jefferson argued the case before the Texas Supreme Court in September. A decision is expected by next year. DiFilippo understood the importance of the case early on. She was a volunteer for the Texas Advocacy Project when she learned what the district clerk’s office was doing in Tarrant County. She’s been working with affected clients since 2012 ona lawsuit she then filed in Fort Worth. After mixed rulings from the district court and appeals court, DiFilippo brought the case to the Texas Supreme Court, with lawyers from Legal Aid of Northwest Texas, Jones Day, and Alexander Dubose Jefferson & Townsend, including Jefferson joining the cause. At stake is the interpretation of Rule 145 of the Texas Rules of Civil Procedure, which was written to make sure that counties pay the court costs for low-income Texans who can’t afford them. 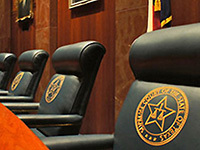 The Texas Access to Justice Commission submitted a proposed revision to Rule 145 to the Texas Supreme Court in May 2013. The revision resolves much of the confusion and varied interpretations surrounding affidavits of indigency. The Commission anticipates action on the proposed rule in the coming year. The Commission weighed in on the Wilder case by filing an amicus brief, which was joined by the Texas Access to Justice Foundation and the Texas Civil Rights Project. The brief, prepared pro bono by Vinson & Elkins, asks the Supreme Court to not only stop the practice of collecting money from indigent Texans in Tarrant County, but to clarify the meaning of Rule 145 in a way that prevents the problem from spreading to other Texas counties. Since a lower court already issued an injunction against Wilder, the district clerk’s office cannot continue demanding payments from parties who filed affidavits of indigency. Whatever the Supreme Court decides, it will be “tremendously significant” for legal aid organizations across the state, said Tom Stutz, who has also worked on the case as director of litigation for Legal Aid of Northwest Texas. If the Supreme Court rules against Wilder, it’ll be that much harder for other Texas counties to demand money from indigent Texans. If the court swings the other direction, the consequences for legal aid organizations could be devastating. If Rule 145 doesn’t allow low-income Texans to avoid paying court fees, legal aid organizations might have to cover those costs for their clients. And in the world of legal aid, “every cent counts,” Stutz said.